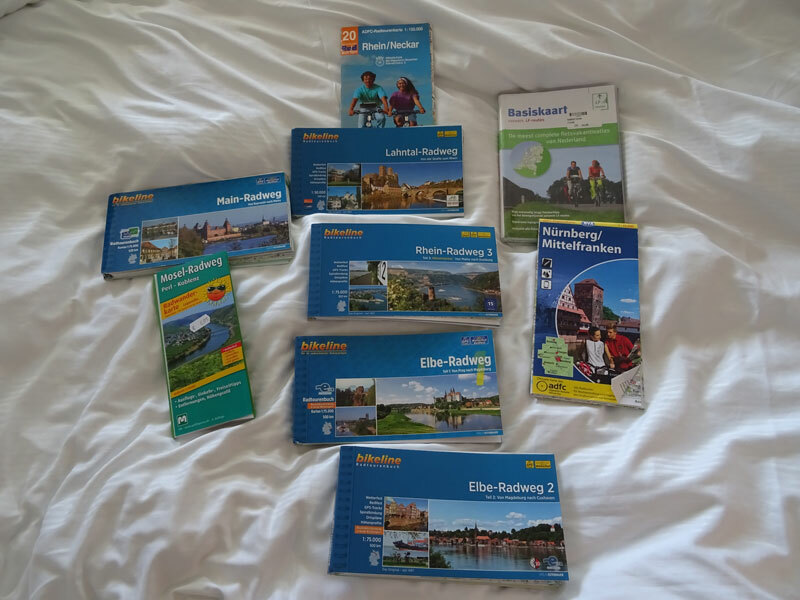 After Jeff’s chemo, our plan was to take a train to Hamburg, and ride along the Elbe River to Dresden, or possibly Prague. 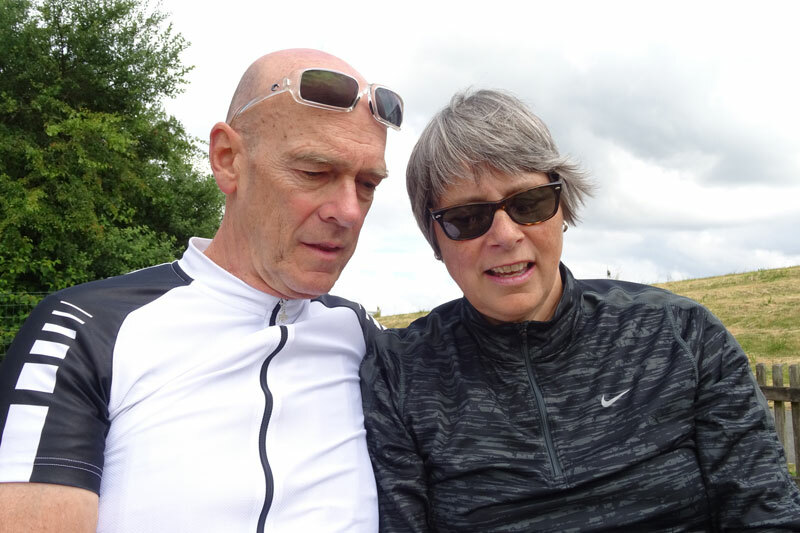 A dicey weather forecast and a more careful study of the cycling maps gave us pause. Below Hamburg, the bike path goes through a large area known as the Elbe Biosphere. It’s a protected nature preserve, with limited amenities. Rain and no shelter can get ugly quickly. We started second guessing ourselves, spending hours exploring alternative options, checking train schedules, route descriptions and hotel availability, only to settle on our original plan. Better to be guided by curiosity than fear. Where oh where shall we go? 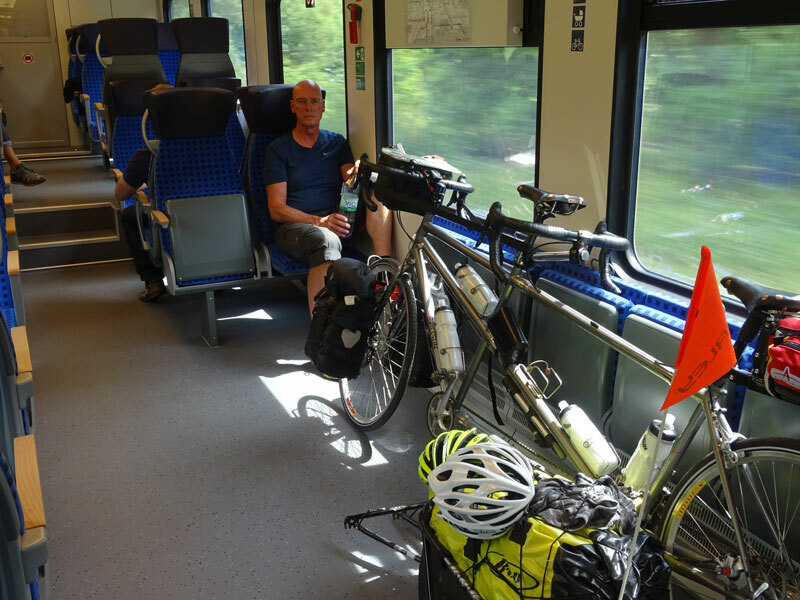 From our interpretation of the train schedule, there was a direct train from Essen to Hamburg that could accommodate bikes. Great. We had taken a number of trains, and were beginning to feel more confident with the process. So, we packed up, and headed back to the train station. Our timing was tight, and there was a 25 person queue at the ticket office. We decided to divide and conquer: Jeff somehow managed to get the bike and trailer on the platform — up two flights of steps by himself — while I waited in line to buy tickets. I finally made it to the counter five minutes before the train was scheduled to depart, only to get the dreaded “That’s not possible” response from the agent. Not possible? Turns out that the IC trains require a reservation for a bike, which must be made at least a day in advance; no exceptions. Our alternative was a regional train, 3 changes and a departure on a distant track. Ugh. So, down one flight of steps, and up two with the beast and bags, one day post chemo. Jeff’s the man; that’s all I can say. 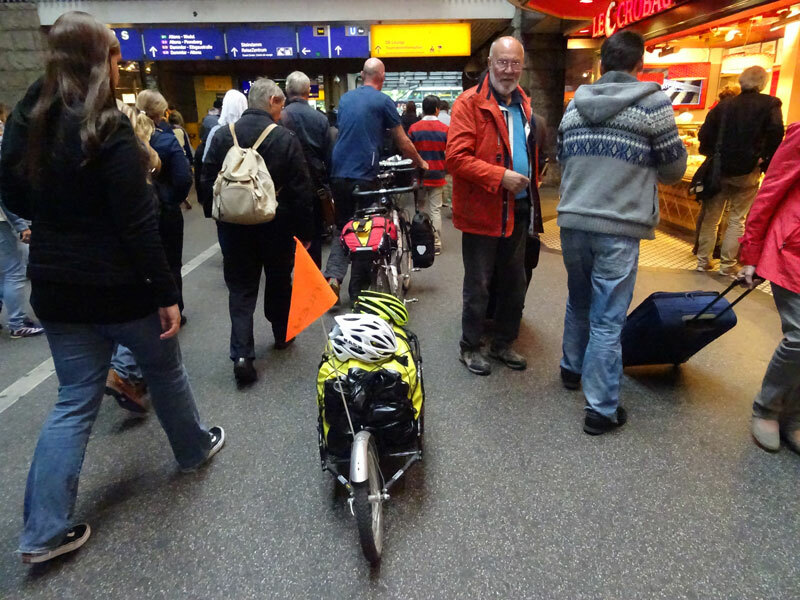 We were both totally unprepared for the teeming mass of humanity at the Hamburg train station. It was truly something to behold. Hamburg is undoubtedly a wonderful city. Everyone says so. But it’s not for us; not now. You can’t do everything, and our thing now is cycling. Hamburg, and most other large cities will have to wait for another time. On to the Elbe Biosphere! It took a surprisingly short time for things to quiet down after leaving Hamburg. Before we knew it, we were cycling through beautiful terrain, with marsh lands and wide expansive views. Not surprisingly it was rife with birds. Really quite wonderful. 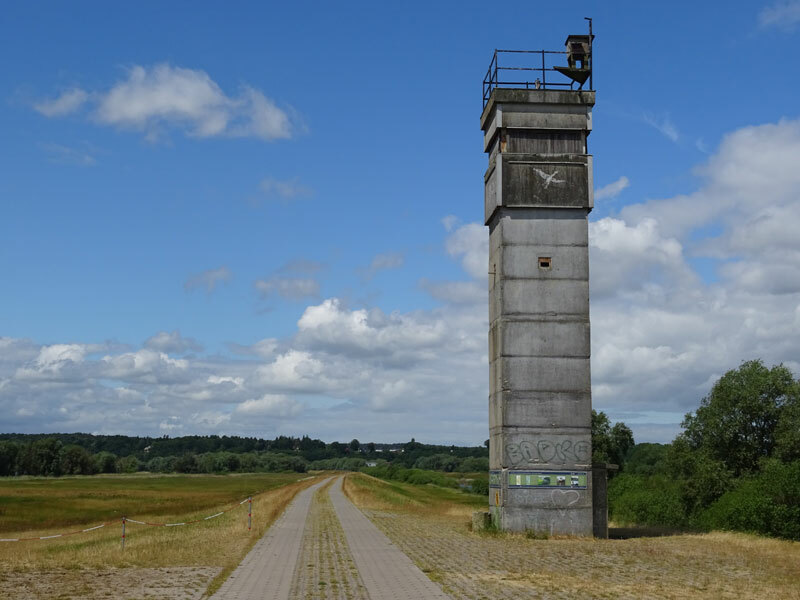 In this region, the Elbe River was the dividing line between the former East and West Germany. We were on the east side, where you can still see the old guard towers along the river, a stark reminder of the cold war days. How could we have considered skipping this area? 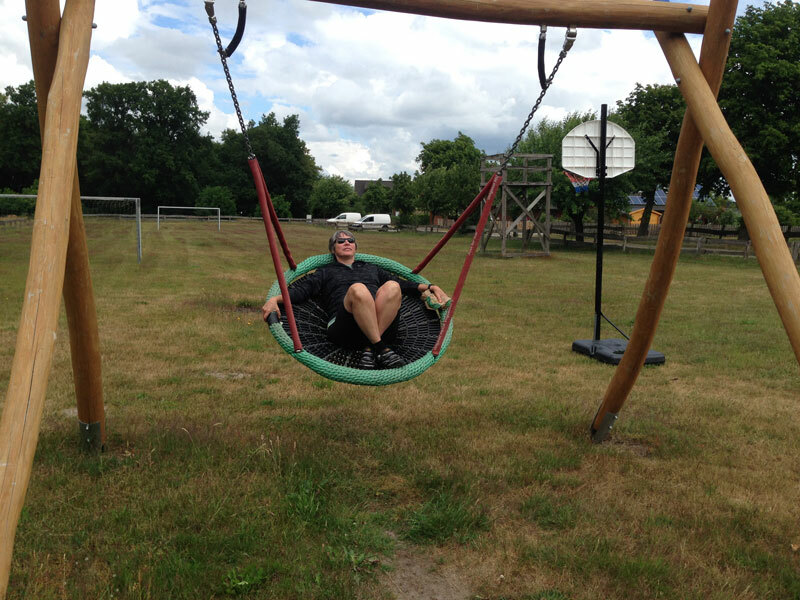 60K of cycling brought us to Lauenburg. We’re in a maritime climate now; very different. It’s cold and blustery. People are wearing coats and the heat was on when we woke up. It was also raining pretty steadily, causing us to question the wisdom of the non-refundable reservation we had made for a hotel 60 km down the road. We waited it out, and lo and behold, the sun popped out. It’s hard to describe the simple pleasure of cycling through the Biosphere. The birds continue to amaze us. Swallows repeatedly played with us, flying alongside the bike, then peeling off, over and over. Then they started crisscrossing us, a few feet in front of the bike. Again and again. It couldn’t have been a coincidence. It was nothing short of magical. The cuckoos have also reappeared. I must buy a cuckoo clock … as a constant reminder of this trip. I am writing now from Gartow, a tiny town on the west side of the river. It has a hotel, two restaurants and a beautiful lake. Works for us! i love the photos! Great couple shot! Who took it? I think your whole trip is magical! And amazing—both of you! A wonderful posting. I envy you for your spirit of adventure and your hardiness. And for the experience your are having! You two are really something. I can’t imagine negotiating those train stations as you described it. Good on both of you! I hope, the weather on the Elbe wasn’t as ugly as it was here the past few days. If it was, I hope you found a cozy place to wait it out. It’s been okay; we’ve been spit on a bit, but haven’t gotten caught out in the rain. Looks clear now for a couple days. Fingers crossed! That must have been something to behold; having birds fly next to you must have been an awesome sight. Thanks JB. Our hearts are full of joy and gratitude along this journey. It is truly an adventure that continues to amaze and delight us.